Back in January, Alyssa Pearl Fusek wrote up a great piece on what would become one of the year's biggest events: the new Imperial Era name. As Alyssa wrote, with Emperor Akihito abdicating his throne this year, and Crown Prince Naruhito assuming the position of Emperor, the government of Prime Minister Abe Shinzo had to decide on a new name for the Imperial Era - an older but still respected system for measuring the current year. The selection process was run under intense secrecy. Experts who were called by Abe to serve on the committee had to hand over their cell phones and any other electronics equipment whenever they met. Speculation was rampant for months, with people making betting pools as to what the initial sound of the new era name would be. Teams of computer scientists used Big Data analytics to make their best educated guesses. In the end, however, pretty much everyone was taken aback when Cabinet Secretary Suga Yoshihide unveiled an option that no one had predicted: Reiwa (令和). As soon as the new era name was announced, it sparked a heated debate on Twitter among Japan-watchers over its meaning. The first character, 令, commonly carries a meaning of "following orders from above," and is most used in words such as 命令 (meirei, order) and 司令部 (shireibu, headquarters). 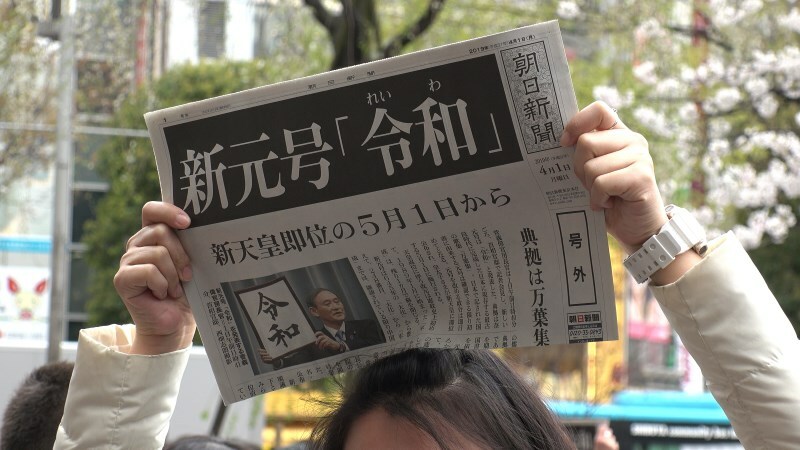 Many people, both in and outside of Japan, instantly raised suspicions that Abe - a right-leaning nationalist who's passed most of his legislation by simply bulldozing over the objections of Japan's minority parties - had specifically selected Reiwa for its "authoritarian" implications. It is now the choice month of early spring; the weather is fine, the wind is soft. The plum blossoms open--powder before a mirror; the orchids exhale--fragrance after a sachet. Like plum blossoms that blossom splendidly and signal the coming of spring after a harsh winter, it will allow each Japanese person with their hopes for the future to transmit our national character - its eternal history and richly redolent culture, its beautiful nature with its changing four seasons - to future generations, and make many flowers bloom to their fullest. It was with this desire for the Japan we wish to be that we decided on Reiwa. (JP) Link: (Full Transcription) The New Era Name, Reiwa, Taken from the Manyoshu; PM Abe: "It Includes the Idea That 'With Everyone's Hearts Beautifully Pressed Together, Our Culture Will Grow'"
Japan's Foreign Ministry later tried to cut off speculation around the era name's "real meaning" by announcing that the official English translation was "beautiful harmony." And, much to its credit, the administration also released an official Japanese Sign Language sign for the new era. The selection of Reiwa is a departure from past era names, which were all drawn from Chinese classics. This is the first time that Japan explicitly sought to pull an imperial era name from its own literary history. "Reiwa" was the ultimate winner from a list of six candidates, which included: 広至 (kouji); 万和 (banna); 万保 (banpou); 英弘 (eikou), and 久化 (kyuuka). The selection is drawing favorable reactions from Japan, with 73.7% of respondents to a Kyodo News Service poll reacting well to the selection. The announcement has also given a hug favorability boost to the Abe admin, which saw its favorability ratings spike by 9.5 points to 52.8% - its highest levels since April 2017. With the name of the new era decided, Japan will now move forward with the official abdication of Akihito, and the ascension of Naruhito (a fairly elaborate and somewhat expensive process that's draw criticism from inside the country). May 1st, Ascension Day, will mark the official start of Reiwa. The immediate upshot for most people in Japan is that most people are about to get one hell of a vacation. As a result, the country will basically have a large "Closed for Business" sign on its doors until May 7th. If you're in business and have important information to communicate to your Japanese colleagues, make sure to get it to them by April 26th! (JP) Link: Why is 2019's Golden Week 10 Consecutive Days? The Holiday Law is the Reason! What Happens From 2020 On? Post-announcement, Japan found itself in "Reiwa Fever." News programs were pretty much "All Reiwa, All The Time" in the two days following the announcement. "Reiwa sales" could be seen everywhere, and Reiwa merchandise was even starting to hit the streets. Amidst all the hype, two pieces of news really stood out to me - one sweet, one corny. On the sweet side (figuratively and literally), 116-year-old Tanaka Kane, the world's oldest living person, received this large chocolate showing with the new era name, as a way to celebrate the fact that she's now managed to live through four successive imperial eras - Meiji, Taisho, Showa, and Heisei. And on the corny side, we have Golden Bomber. The famous air band group, best known for its 2009 song Memeshikute (女々しくて; "effeminate"), apparently saw the opportunity to be known for more than one song and seized it. Within less than 48 hours, the group had written, put together, and performed their new song, "Reiwa," on NHK's show Utakon, in a production that can only be described as...well, see it for yourself and fill in your own blanks. The Reiwa announcement wasn't all songs and confections, however. It was also an opportunity for criminals to fleece people out of their hard-earned money. I've written previously about various kinds of scams targeting primarily elderly people in Japan - such as the "Apo-den scam," in which a scammer impersonating a family's son attempts to convince someone to yank a bunch of cash from the bank, which the scammers then steal by breaking into the apartment. The introduction of the new era name provided scammers an opportunity to invent an entirely new form of deceit, in which they ring up elderly people and convince them that their debit cards are now "expired" due to the advent of Reiwa, and need to be turned in. The scammers then show up and confiscate both the card and the victim's PIN, and use both to withdraw as much cash as they can. (JP) Link: Caution Needed on New Era Scams; Elderly Victims of "Cash Card Will Change with New Era"
At least five elderly women have fallen victim to the scam already. It's sad to think that, in the lead-up to the era announcement, some people sat around tables in smoke-filled rooms and debated the best schemes they could deploy to take advantage over the ensuing confusion. No matter where you live, it seems, someone's always looking to make a quick buck at other peoples' expense. Newspaper today. How to beautifully write Reiwa. Names are always ripe with meaning and open to interpretation. This is especially true with Japanese, a language with an extensive literary history that dates back to pre-Christian China. Officially, "Heisei" (平成) - the current era - was meant to symbolize "the establishment of people - inside and outside of Japan, in Heaven and on Earth." However, some took advantage of the alternate meanings of the kanji to sneer that it really meant "flat growth" - a reference to the Japanese economy's lackluster performance since the bubble of the 90's. Ultimately, only 39.8% of respondents to a Kyodo poll said they viewed Heisei favorably. (19.9% viewed it unfavorably; 40.3% were undecided.) So how will people come to view Reiwa? Much of that will depend on how well the country's leaders can respond to the various challenges Japan faces, such as de-population, immigration, economic growth, health and welfare, and protecting the rights of women and minorities. And it will also depend on the new Emperor, Naruhito, and the type of symbol he becomes for his people. In the end, no scanning of kanji etymology will give Reiwa its meaning. Only the people of Japan - and the passage of time - will tell us what Reiwa truly means.